Pride & Prejudice 傲慢与偏见 (UK,2005) - 英语电影角 - 英语交流吧论坛 - Powered by Discuz! Pride & Prejudice was only the second faithful film version after "the famed, but oddly flawed, black-and-white 1940 adaptation, starring Greer Garson and Laurence Olivier," and until 2005, The Times considered the 1995 television adaptation "so dominant, so universally adored, [that] it has lingered in the public consciousness as a cinematic standard." Wright's film consequently met with some initial scepticism from fans, especially in relation to plot changes and casting choices. 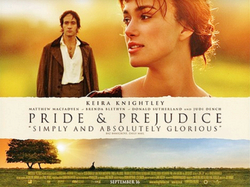 Comparing six major adaptations of Pride and Prejudice in 2005, The Daily Mirror gave the only top marks of 9 out of 10 to the 1995 serial and the 2005 film, leaving the other adaptations behind with six or fewer points. The film received an average review score of 86 percent according to review aggregator Rotten Tomatoes. Metacritic reported an average score of 82 out of 100, based on 37 reviews and classified the film as "universally acclaimed". Critics claimed the film's time constraints did not capture the depth and complexity of the television serials and called Wright's adaptation "obviously [not as] daring or revisionist" as the serial. JASNA president Joan Klingel Ray preferred the young age of Knightley and Macfadyen, saying that Jennifer Ehle had formerly been "a little too 'heavy' for the role." Peter Bradshaw of The Guardian, while praising Knightley for an outstanding performance "which lifts the whole movie," considered the casting of the leads "arguably a little more callow than Firth and Ehle." He does add that "Only a snob, a curmudgeon, or someone with necrophiliac loyalty to the 1995 BBC version with Colin Firth and Jennifer Ehle could fail to enjoy [Knightley's] performance." At the time, BBC film critic Stella Papamichael considered it Knightley's "best performance yet." Critics were divided about Macfadyen's portrayal of Darcy, expressing pleasant surprise, dislike for his lack of gradual emotional shift as in the novel, and praise for his matching the insecure and sensitive personality of the book character better than Firth. Critics also drew attention to other aspects of the film. Writing for The Sydney Morning Herald, Sandra Hall criticised Wright's attention to realism for being "careless with the customs and conventions that were part of the fabric of Austen's world." In another negative review, Time Out magazine lamented the absence of Austen's "brilliant sense of irony," remarking that the film's "romantic melodrama's played up at the expense of her razor-sharp wit." More positively, Derek Elley of Variety magazine praised Wright and Moggach for "extracting the youthful essence" of the novel while also "providing a richly detailed setting" under Greenwood and Durran's supervision. Equally pleased with the film was the San Francisco Chronicle's Ruthe Stein, who wrote that Wright made a "spectacular feature film debut" that is "creatively reimagined and sublimely entertaining". Claudia Puig of USA Today called it "a stellar adaptation, bewitching the viewer completely and incandescently with an exquisite blend of emotion and wit." GMT+8, 2019-4-23 05:53 , Processed in 0.154768 second(s), 40 queries .